Being a coder certainly has it's benefits. But without critical theming skills, you can start to feel a little like a sandwich without tomatoes. Or a crossbow without arrows. Or a pair of pink sunglasses without sequins glued on them. Or a ... well, you probably get the picture. But, if you do get the picture, can you theme it? We're moving steadily forth into our 5th week of theming videos, and things are starting to get interesting. After laying down the basics like knowing what the theme layer is for and how to find the source of any output in Drupal, we're starting to peek into some theme folders and see what treasures lie within. Theme directories are a wildcard, you have a lot of freedom to set things up in a multitude of ways. But that freedom comes at the price of sometimes not knowing where to start. This week is dedicated to theme file-gazing. We first look through the core Drupal themes and see how they have their files set up, and then we move onto four of the most popular contributed themes: Zen, Basic (a Zen offshoot), Fusion (FREE video) and Marinelli. Each theme has unique strategies and lessons to teach, and will help you get a feel for where to start as you develop your theme or modify an existing theme. Next week we'll be getting deep into code, leveraging all of the tools and techniques we've reviewed this last month and begin to build an entire theme from scratch. Several issues have been fixed in the source code resource pack, so please download the new version if you're following along. Themes are touchy beasts. A line of funked-out CSS or a misnamed template file can send you careening down a path of sadistic uncertainty if you don't know what you're looking for. Well, here at Build a Module.com we think that's a little unfair. We should be able to change how our sites look without fear of wasting an entire day barking up the wrong tree, and this next batch of new videos is all about absolutely crushing that fear. To begin with, we dive into some theme troubleshooting, looking at what happens when some HTML output you're trying to modify is getting lost in the shuffle. Next, we help you troubleshoot CSS issues, where styles you're trying to add just don't seem to be working. Since these last two videos are part the first chapter in our Drupal Theming Essentials series, we wrap it up with a review of the rich theming topics we've covered and some suggestions for next steps. But wait, that's not all! We also begin our next chapter - aptly titled How to Build and Modify a Drupal Theme or Sub-Theme - with an overview of the themes that come with Drupal, along with a couple other core theme resources and a guide on where to put new themes. We then take you on a tour of the different components of a theme, including the .info file, the template.php file and lots more. Next week we'll be diving into how to structure a theme directory and take a look at several interesting examples in both core Drupal and contributed themes. Spread the code "springbreak2011" for FREE form-building videos! Spring break is a time where people work on their form, right? Sun bathing, surfing, lounging about. As a conciliatory prize for those of you returning from spring break, or suffering in some other way from the end of those blissful days, we are offering all of the videos on our site that have the word "form" in them for free this next week. But only if you know the code. If you know anyone that could benefit from a little Form API action, send a little tweet gently encouraging them to go to https://buildamodule.com/code and enter the code springbreak2011. That will grant them free access to form-building videos until March 28th, no strings attached! This year's Drupalcon was most excellent! I had the opportunity to meet a number of current and soon-to-be subscribers, and get some feedback on what you'd like to see in the future. Overall it seems like we're headed in the right direction, and I wanted to thank you so much for all your great ideas and insights. I'm looking forward to more face time at the next Drupal event! As we complete the first chapter in the "Drupal Theming Essentials" video series, we demonstrate how to work with view modes in the Drupal user interface, how to leverage field formatters to re-use themable output on the field level, and discuss various standards around working with the theme layer. If any of that sounds a little foreign to you, don't worry, these videos will gently introduce you to each concept. Last week we rolled out a nice little interface upgrade which is subtle enough that I thought it might be good to point it out with huge red arrows. With the new navigation tools, you no longer have to scroll through the (rather large) list of videos to get to the one you're looking for. Instead, just use the arrows to move forward or back, or click the list icon to display a pop-over will all the videos in the current series you're viewing, plus navigation to switch series' as well. 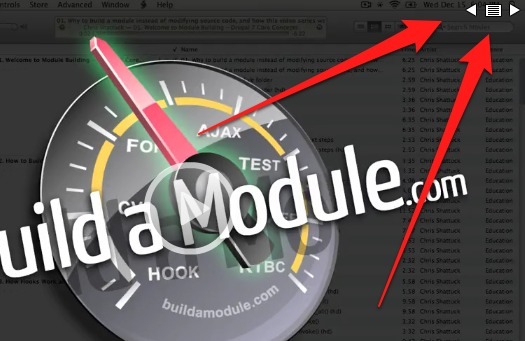 If you're spending a lot of time on Build a Module.com, then you should notice a pleasant productivity boost. 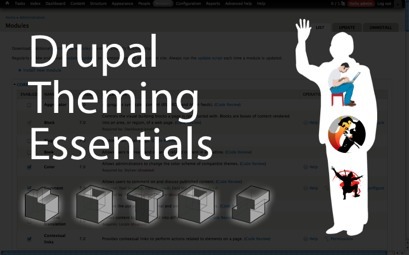 This week we release our second batch of "Drupal Theming Essentials" videos. In this one, we tackle a couple of hairy questions about where to put the code you use to override output, discuss a couple of essential theming tools, and discuss view modes - a handy way to modify node output code-free. Enjoy!